Posts categorized "Show and Tell"
Hey there Sweet Company Girls! Remember me?? I had said au revoir at the beginning of July as I plunged into the busiest summer of my life...and now it is mid-August! Phew.The summer flew by, filled with projects and travel. I had promised updates and photos along the way, and kept hoping to have "finished" things on the TV set to show you....instead I simply have "progress" shots that will have to do. Our big project took us to Colorado Springs, where we installed art, finishes and backdrops for Andrew Wommack Ministries' new television set. We stained MILES of logs and trim. Miles. Bet you thought I had a glamorous job, huh?? It was a bonding experience for Grayson and I, staining gigantic window frames until we were silly. The fumes "might" have had something to do with our silliness. Did I say we got silly?? We did. I refinished furniture. Here is a Before Picture of a table....zzzzzz, BORING. The table top will be replaced with granite, and the base and chairs sport a new ebony distressed finish. We made a 3D background scene of Pike's Peak and Garden of the Gods, which will be viewed through the window frames. Let's just say.....it was complicated. But worth it. Walls started getting put together the day I left. Everything was built and finished in pieces for final assembly this week. When we return for touch-up in a couple of weeks, it should all be looking great. Here we are putting texture on one of the walls. Gray and I helped with this step, and Tom added the final three layers for a beautiful finish. This is part of an art piece made out of copper. Remember that patina brew I made with ammonia and salt? Well, this is how it turned out. This will be mounted on an ebony panel and given a luminous finish coat. I think it's cool!! I was sweeping the floor while they were doing some lighting/camera tests with the wall finishes...they made me sit down for a photo and wouldn't let me get rid of the broom. I felt a little foolish, certainly not glamorous. We finally made it home from Colorado Springs for the last week with our son before he goes off to college. Tom is now out of town again and will arrive just in time to say goodbye. I hate that he is missing these last few days. I'm trying to soak up as much fun as I can with this boy....cookies and milk are always a winner. He made me promise to "save the waterworks" until Sunday, so I'm holding it together, barely. There is so much I want to share, not just about the work, but about the things I've been pondering these past weeks. For today, I will try and exercise restraint... and simply let my upcoming posts encourage and challenge you as I get back to the Small Things. My heart is full. In all the busyness of parenting and work and keeping the wheels on, I remember that there is a God who is found in the small things, in quiet moments, in simple pleasures...and even in the hard tasks. He delights in us, and we are His. I'll be back tomorrow with daily Small Things to help you (and me) enjoy the "keeping the wheels on" part of life......thank you so much for waiting for me and for the wonderful sense of community as we "do life" together. You are each special and so very loved. I had hoped to post photos earlier today, but I got into a groove working on my office and I didn't want to stop down. Now I'm pooped. But as promised, here is what it has looked like during the transformation. *Disclaimer - all photos are from my phone, so....that explains the (lack of) quality. I plan to do a "real" photo shoot when I'm completely done. Okie Dokie. First, let me say that this space is a small loft area that overlooks our "real" office downstairs. It is oddly shaped (Kind of a "U") and has zero storage. But it's MINE, and I love it. It started out with the walls painted a bold green. I enjoyed the color quite a bit for a couple of years, but found myself yearning for a really clean, simple palette. Art is so messy and cluttered as it is, so I opted to go for a big change. The week before Christmas, I decided to tear into it, why not?? Gooda time as any, right? I want something feminine and vintage, but just a little bit industrial - not cluttered. Hmmm. Is that asking too much? Here is my office "Before." After much debate, second-guessing and going back and forth, I landed on Sherwin Williams Rice Grain for the walls. I'm still not sure how I feel about the green/gray undertone, but it's done and I'm not repainting. It works fine. But maybe I should have gone with something warmer. But then again....OY! Oh, what a mess! But starting to feel nice and light! I put everything back together and "shopped" my house for the little club chairs (garage sale find: 25.00 for the pair). That old brown dresser, which was given to us when we were newlyweds and we hated it even then, has stored craft supplies for years.....but boy, was it tired-looking. Again, a debate about what color to paint it. Good grief. So here is where I started today: priming and painting the dresser Antique White. I've already painted the bookcase and a small dresser in that color and decide I want everything to blend together. Clean, Rachel, CLEAN. You can do it. OK, don't know why my phone cam turned everything so golden, but here is pretty much where I'm at right now! I love the paint job on the dresser - now I just need 16 pulls. I'm so cheap, I don't want to spend any money on cute hardware for my 28+ year old FREE dresser. On second thought, I saw some darling ones yesterday at JoAnn Fabric.....wait, did I say that piece was FREE 28 years ago?? Maybe I'll splurge. The little corner at the top of the stairs got the small painted dresser. I bought three sections of an old picket fence at a garage sale (15.00) to use at our daughter's wedding in November. One section fits just right under the low wall that overlooks downstairs and helps balance all the furniture lined up on the opposite wall. Love this. Here is my work table. I have storage issues, but for now a pre-primed piece of wainscot from Home Depot is hiding the boxes stacked underneath. The lights are work lamps from Home Depot for about 11.00 each. I took off the clamps and hung them with small clips. Oooooh, me happy. I'll deal with the visible cords another day. I started working on the shelves. I'm sure that someday they will have nothing but art supplies in containers on them, but at least for now I can enjoy a few pretties set out. I'm creating a little window seat nook!! Anyone know how to make a cushion? The curtain panels were 4.99/pair from IKEA, and I tied them with a bit of burlap ribbon. I spent the rest of the day cleaning out drawers and organizing them so I can find my art supplies when I need them. I put together the white IKEA storage boxes for the bookshelves, and tried to deal with the boxes that are stored under my work table. I made a huge mess in the hallway with all the junk I hauled out of there - again. Where does all this stuff come from, pray tell? So, you ask, what's left to do? 1. Prime and paint the old, dark woodwork - blech. I think it will look amazingly fresh when I get that done. Will probably paint the door to the walk-through bathroom black, someday. 2. Install new hardware on dresser. 4. Find a small round ottman or table for my tiny seating area. Maybe. 5. Trade out woven baskets on shelves for old metal locker baskets. Need that touch of "vintage industrial." EBay, here I come. 6. Would love to trade out the black basket storage to the right of the long dresser for a galvanized metal rolling storage piece. I've actually never seen what it is that I want...but think it would be cool. 7. I've got my eye on a lamp with a mercury glass base at Marshall's - I NEED it so I can return the one I stole from a bedroom to set on the painted dresser. I think it would be perfect! 8. GET BUSY CREATING ART!! Pretty soon I'll have no excuse not to get cranking. "Vintage Feminine Industrial?" Maybe that's what I'm going for. Tell me what you think about my progress so far. I'm open to ideas and suggestions!! Wow! What a Country Wedding! I almost don't have words to describe the wonder of this weekend. It was just incredible and my heart is FULL - of love and happiness and gratitude to all the friends and family who helped us put on our daughter's wedding. Here are a few photos from Saturday, courtesy of my dear friend Bridgette, who worked tirelessly behind the scenes to tie up all our loose ends, and my brother in law Dennis, who helped serve food to all our guests. Meghan and Nathan saying their vows. Tom and Meghan. She is radiant.....he is just trying not to cry again. Our family, (left to right) daughter Lauren, SIL Robert, my man Tom, Meghan, Nathan, me, son Grayson. Two hundred and fifty chairs were set up in the clearing. My florist friend, Kim May, decorated everything so beautifully. We forgot to set out pictures of the bride and groom....oh well. My fancy hors d'oeuvres table: peanuts, M&Ms and pretzel mix. Also on the table are the fixings for s'mores.....and mosquito spray. Aren't those potato sacks cute? I bought them at fabric.com. Cake was made my my sister-in-law Janna. We made a vignette with my grandmothers' wedding dresses from the 1930's. We also displayed Tom's mother's dress from 1959 outside the "ladies" restroom. It was so very special! I love this photo of Meghan and Nathan! Tired and happy....we made it. I can't wait to post more photos, especially of the barn and reception area. Despite our limited bathrooms and lots of last minute details that got overlooked or went undone, the wedding was just wonderful. It's finally sinking in that it's all over and now we can start to really savor the memories. We were so blessed by the help of friends and family to put it all together.....and we are truly blessed to have a fantastic new son-in-law! I'm still catching my breath, so I'll start back with daily Small Things as soon as I can. Thanks so much for hanging with me while I've taken a break to focus on this special time! The Jack Russell Terrier is done......boy I hated painting his eyes. I wanted to glue some googley eyes on and walk away, it was so hard. The distant pasture and horses help balance the jumping horse. Looking at the photo, I see where I need to go back and fix the furthest colt's feet. It looks like he's wearing high top tennis shoes. How did THAT happen?? The growth chart just needs some feet and inches marked on it and it's done. The pink flowers are really just blobs of red, pink and white paint, all smooshed together...but I love how they soften the "plank" of wood. I'll skip photos of the memo board, since it needs quite a bit of work, and move on to the hen and chicks. I had used a simple line sketch for my pattern, which had no details on it at all. I was really kicking myself for not having better reference material on hand when I started painting the details. Chicken enthusiasts, forgive my hack job - I know it's all wrong.......but fortunately, no one really cares. Thanks for journeying along with me through this mural process. It was painfully slow, but as of today....IT'S OVER!!!! Time for some coffee, my friends. Link up below for a fun round of visiting, and being visited by, some of the nicest people on the planet. Simply put your blog post URL into the Linky Tool and enjoy the company. Non-blogging Company Girls, feel free to chat in the comment section - because we appreciate your presence, comments and participation too! On Monday, we'll get back to doing Small Things together! Woot! I've missed getting together each day for our daily dose of fun and accomplishment.....and I must say my house will be grateful for the attention. Let me ask you: Do you subscribe to Home Sanctuary via email so that you won't miss a single post? Please don't tell me "no." :) Here - I'll make it easy for you! If email subscriptions aren't your thing, you could subscribe in a reader of your choice by clicking here. I've come CLOSE to finishing the horse murals. I took off over a week, so this has really gotten dragged out - but I'm feeling pretty good about the results. The bathroom "tack room" got a signboard, bridle, rope and a bunch of doo-dads. Sometime I'll have to show ya'll how to paint greenery and flowers because it is SIMPLE! You could do it, I promise. Tack supplies, complete with a little furry friend. And another one, with cheese. Random stones and greenery break up the huge expanse of beige walls. There will be some framed prints on each side of the armoire, so the stones will recede into the background. The homeowner liked the "wood" wainscot so much that we brought more of it out into the bedroom area. The built-in desk needed something, so I've painted more stones and I have the start of a hen and chicks going. It would be cute to have some painted chicken wire, but I'll have to feel inspired to add it and I'm kinda tired. There will be a playful Jack Russell Terrier on a hay bale, and you can see he is base-coated in. I could not get the homeowner's dog to sit still long enough to take a photo to get the markings right so I gave up and moved on to the chicken. Now that the furniture is in place, the horses peeking through the barn door look right at home. There are only a few more details to finish up and then I'll be able to put my brushes up for awhile. Whew! Well, have YOU had a good week? We'd love to hear about it! Link up below for our weekly feature, Company Girl Coffee. It's really simple and it's a great way to get to know some delightful friends. Then venture out and visit as many blogs as you can! Easy, peasy. Here are some photos of my "crew" and I installing the graphics at Life Church. The blue tape will come down after the panels get glued together to create one "seamless" piece. This wall is 20 feet high and 60 feet wide. Eventually there will be smaller banners in front of this background graphic that will depict the different ministries in the church. What will be cool is that the ministry banners will have a layer of the background image in them, if that makes sense, so it will all work together to create a 2D graphic. On the opposite wall, we have the "water" graphic. The scripture that inspires this is out of John..."the water I give will become in him a wellspring of water, springing up to eternal life..." This wall will also have banners hanging in front that will represent both missions and the church vision. G.T. has been an awesome help! I don't know what we would do without him. 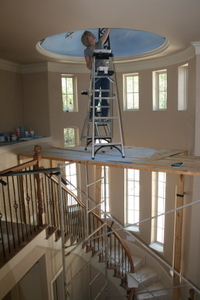 Every time he heads up the scaffolding, that's one less time for this old bod to have to go up. I tried to use the "hairdo exemption" to get out of wearing the hard hat, but to no avail. Lining up each panel is PAINSTAKING work. It must be absolutely PERFECT at the top or by the time you get down to the bottom it's off by a mile. My husband is Mr. Meticulous and makes sure it is perfect every time. He has incredible patience. G.T. and I are the tapers and aligners below. I'm also the "gofer" to get tape, staples and supplies to keep them moving along. Here's a window I painted last week for a local business. They were participating in a contest for downtown businesses...Best Christmas Window Display or somesuch thing. Anyway, they called me at the last minute and asked if I could do a nostalgic theme to set off their display inside the window. Lettering took the most time, but was not difficult. I created a pattern on large banner paper and taped it into place on the inside of the window. Then I just painted in the letters, (following the pattern) on the outside of the window. The hardest part was waiting for the paint to dry in between the 3-4 coats. Tedious. Painting "Garland" was really easy! I used three shades of green (Folk Art paints) and squooshed a chip brush randomly so that the bristles splayed out as I went. If you start with the darkest green first and then work your way to the lightest green, you can get some fun depth. Pinecones would have been a cute addition, but by that time, it was getting dark and cold! I heard that this window won one of the awards, perhaps "Best Last-Minute Decorating" and it was fun to do! It put me in the holiday spirit! Here are some photos of the finished mural in the gorgeous house I told you about. It got a little chilly that last day, but I wore work boots and skivvies under the jeans, so I survived. I used four paint colors, plus the wall color to create the tone-on-tone look. I purposefully did not add much detail to the mural so that it would look like a soft backdrop to the furnishings and lighting that will no doubt be spectacular. I'll list the colors I used below. The wall color is Benjamin Moore 314-4 Spiced Vinegar. It is a neutral that looks really nice in different lighting. I used it as my base, and mixed it in with my other colors as needed. I basically made a palette of graduating colors: Sherwin Williams 6119 Antique White (BM 314-4 Spiced Vinegar) Sherwin Williams 6123 Baguette (love this color) Sherwin Williams 6124 Cardboard Sherwin Williams 6146 Umber By mixing each color with it's lighter and darker neighbor, you can come up with about 9 values of color. I mostly mixed as I went, except for when I needed to cover a large area with a mixed shade (like the cloud base). Then I mixed the two colors in a mixing tub to get enough to cover. I used Purdy brushes (2 1/2 and 3 inch) for most of it, with an angled 2 1/2 inch brush for the clouds and trees. An angled 1/2 inch Purdy brush is good for dabbing in trees and shrubs. So are "chip" brushes. For the smaller details, I used artist brushes. The other useful artist tool is your finger (I personally use my ring finger) to smudge and soften. It's readily available at the end of your arm, for free. For resource material, I used photos from magazines and books of Tuscan scenery. I kept the pages open in front of me as I worked, often taping them to the wall so I could easily see what I wanted. I would love to see this house when it is completely finished and furnished! I am very honored to have my artwork featured so prominently in this fabulous home. Feel free to email me if you have any questions or comments! I'm happy to share. Me, with my head in the clouds. Some soaring kestrels add the finishing touch. And then there was this project, one of my least favorite jobs of all time. Let's just say I should have charged more, for second-hand smoke lung damage. I would love to blog about this job, but kindness prevents me. 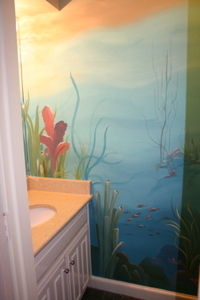 An under-sea powder room. The homeowner made me paint out some anemones because they reminded her of male body parts. Oooh Kaaaaay. Did I mention that the people didn't run their air-conditioner? Texas+August+a stinky bathroom+breathing cigarette smoke=not fun. I still need to post pictures of this summer's big project...I'll get to that one of these days. It was infinitely more enjoyable than the undersea extravaganza. Notice the ceiling falling down and all the paint splatters on the walls. Very uninspiring. Also notice the large yellow lab standing inconveniently RIGHT IN THE DOORWAY, so as to cause us to have to push him out of the way every time we passed in and out. I wish you could see how gorgeous the red wall is. It is Sherwin Williams "Fireweed", 6328. Talk about inspiring! A perfect red with just enough brown in it to make it warm and rich. Makes me want to use it in the house somewhere. Large yellow lab is no longer permitted into our posh new digs. So he LAYS right outside the door so we can trip over him every time we pass in and out.